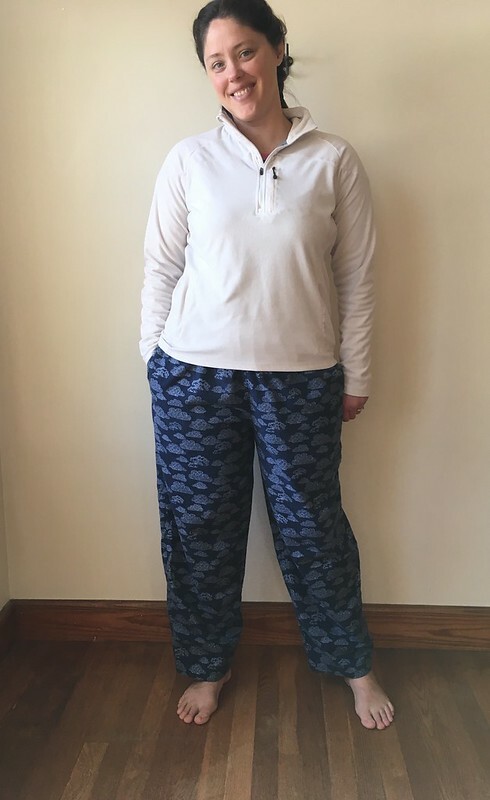 It was time for a quick and easy project, I needed pajama pants, and I had some cozy flannel that had been in my stash long enough. 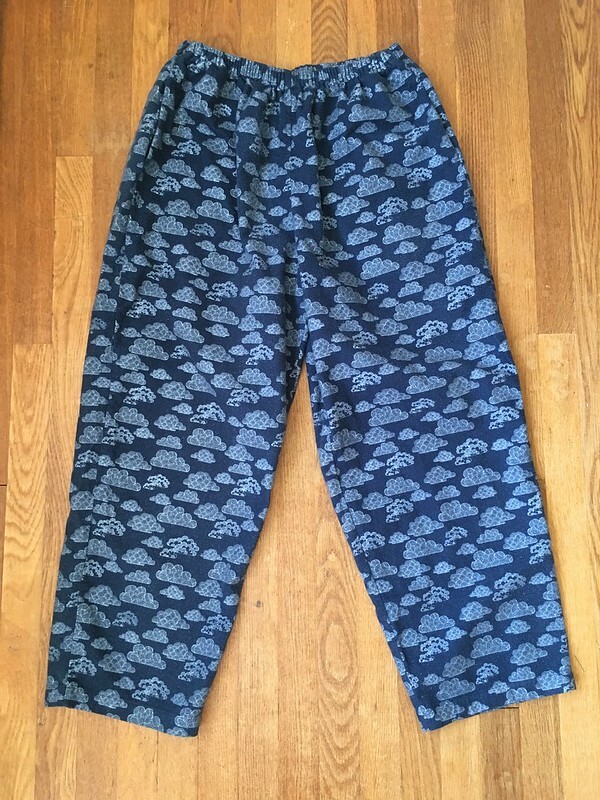 And when all those things aligned, I finally made myself some soft and cozy pajama pants. 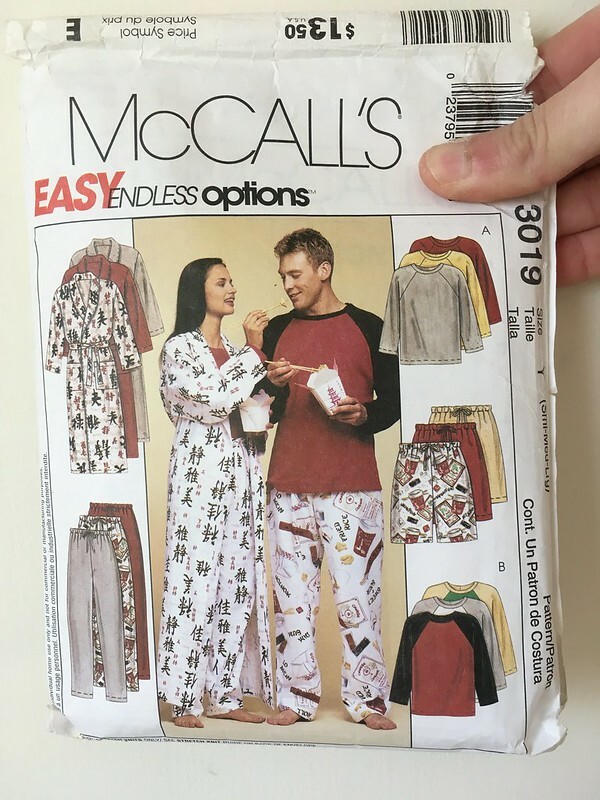 The pattern is out of print (OOP) McCall’s 3019 circa 2000 (easily found on Etsy). This is my go-to pajama pants pattern for my husband. It’s a unisex pattern that we got from my mom, and it’s a favorite for its loose fit and POCKETS! You can use it for pants, shorts, a raglan shirt or a long robe. So far, all I have used it for is pants. 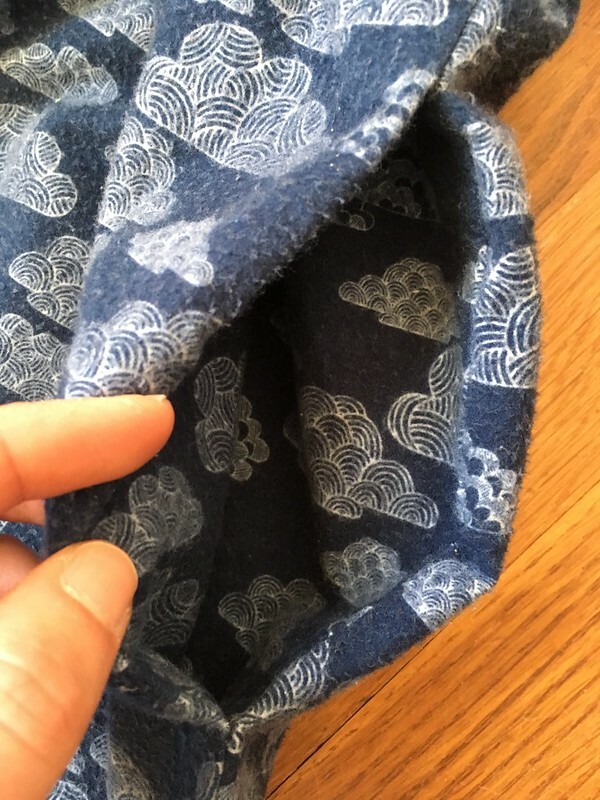 The fabric I used is an organic cotton flannel from Cloud9 Fabrics, with a great cloud print on it by artist Eloise Renouf. I got this fabric a few years ago from Pintuck & Purl, but wasn’t sure what to use it for. I really wanted to make a shirt out of it, but all I could see when I looked at it was pajamas. Finally, this year, my need for pajamas and an easy project was so great that I knew it was time to use this fabric for its true purpose: the coziest flannel pajama pants I have ever owned. I’m a pretty big bargain shopper, so I usually go for the best quality at the lowest price. I used to always buy cheap flannel on sale whenever I needed flannel, so this was my first experience with organic cotton flannel (I think…I forget a lot of things…). And there is a huge difference. I already knew there was a pretty big quality difference between the flannel I had been buying on super sale at the big box stores and quilt shop flannel, but this organic cotton flannel is the best. 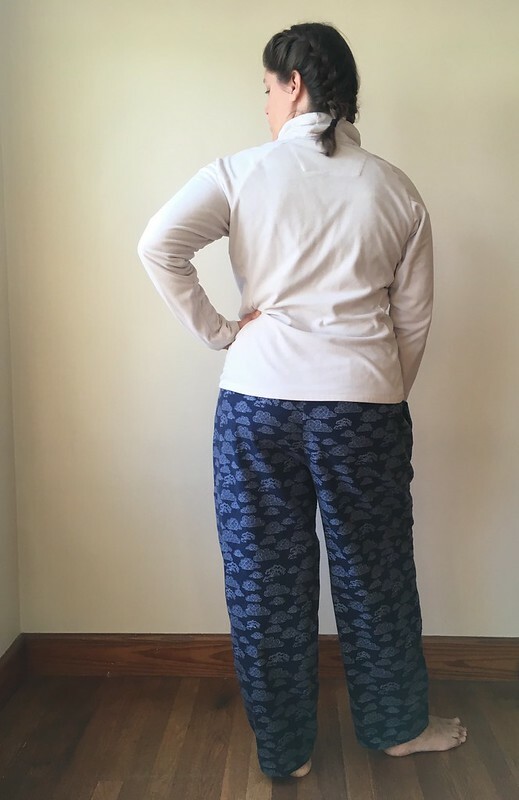 It’s really substantial and soft, and I will admit that for the first few weeks after making these pants, I kept wondering how early I could change into them each night (or afternoon…it gets dark really early in the fall here). 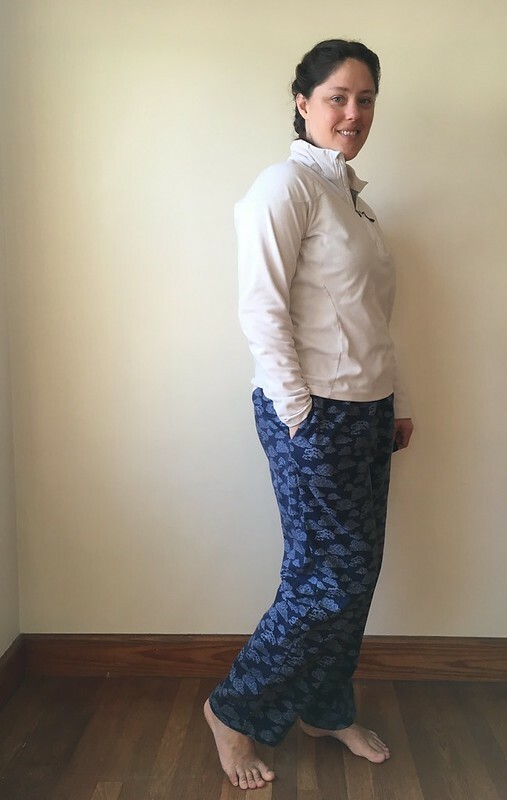 So the pants themselves–this was a quick and easy pattern to sew, as expected. It only has three pattern pieces: front leg, back leg, and pocket. 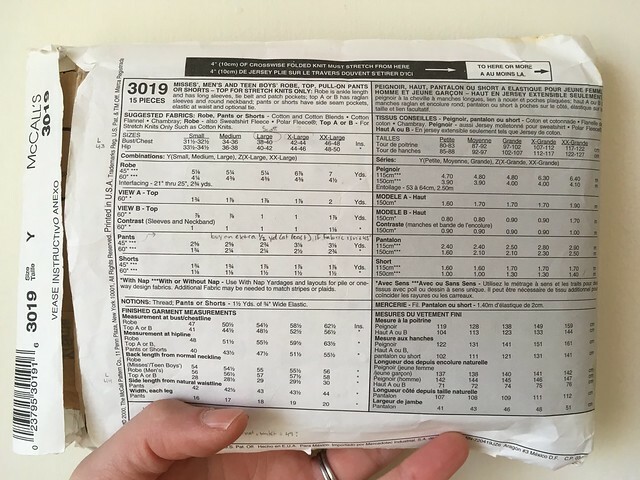 My measurements put me in an extra-large size. 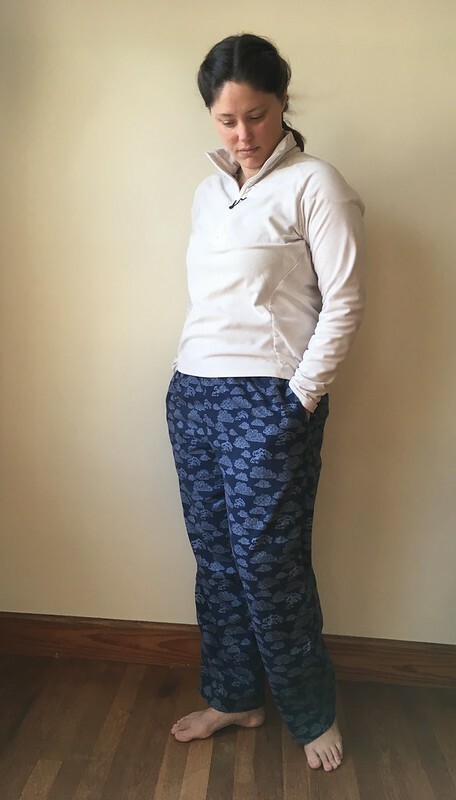 The pattern only covers small, medium, and large, but I tried on the last pair I made my husband, which are a large, and found that they fit fine. 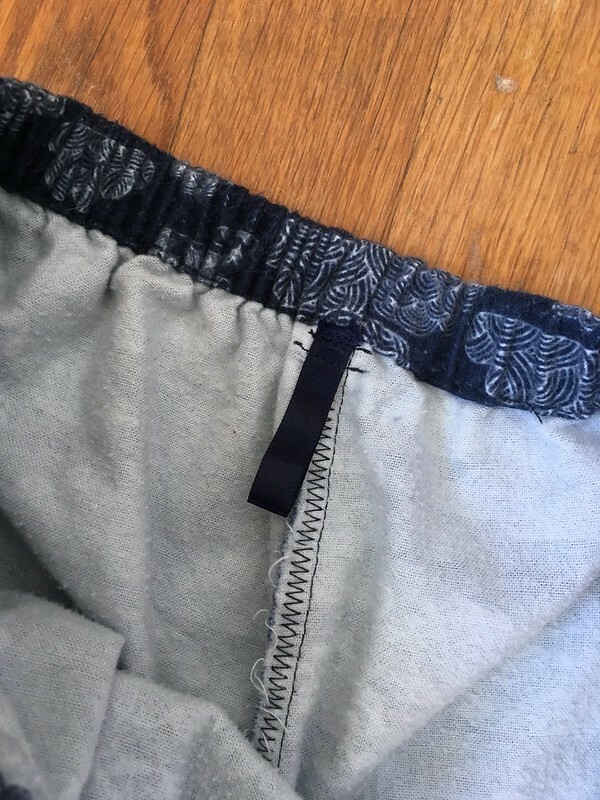 I figured I could cut the large and sew with a 3/8″ seam allowance instead of a 5/8″ seam allowance to give myself a little bit of extra ease, knowing I would actually be fine either way. This worked out great. The pants are nice and roomy. I’m really happy with the fit. I sewed them with a straight stitch and zigzagged the seam allowances, because I was after SPEED! I added some elastic to the waist and a little ribbon tab at the back, and I was done! And now I sleep in cozy bliss whenever these pants aren’t in the wash! I really do need another pair, but I’ve got enough other projects I want to make that that probably won’t happen. The fabric has begun to pill a little bit, but it still feels just as soft. You can see it a bit in this picture of one of the pockets. It doesn’t affect the feel of the fabric, though. All in all, this was a great project. It was a good, quick sew and yielded something that is worn even more than most of my other projects. I plan to take some time off for Christmas (Merry Christmas! Happy New Year!). I don’t know if it will just be a week or two or perhaps a little bit longer, but I should be back in January or maybe early February if I decide to extend the break. I hope you all have a wonderful holiday and enjoy this first official day of winter (Winter Solstice! ), knowing that now the daylight will start coming back. Yay!